The day the Turner family gets their very own monster is a momentous event in the neighborhood. Except, the monster that shows up isn’t the monster they ordered at all. There is a fine line between what you imagine and the reality of what happens when you actually get what you want. The story That’s Not the Monster We Ordered reminds me of the day we brought home baby, Brie. Her oldest sister was so excited and proud – until the baby cried, and then took some attention away from her, and then cried some more (Brie had colic so it was a very long first year and medication totally saved our sanity and her comfort), and while Brooke always loved her sister as much as ever, I imagine she thought at times, ‘this is NOT the sister I ordered!’ Ha! Having a pet monster SEEMS like a good idea to the Turner family (hey, it’s Halloween season, it could happen! ), and when their own monster arrives, he is the talk of the town. Everyone is curious about the monster and gathers at the Turner’s house for the occasion. First, everything seems peachy! The monster can roar louder than a lion (ohhh! Ahhhh! ), he leap down the stairs better than any Slinky (SO COOL! ), and eat grass so no one needs to mow (high fives all around!). Based on the Turners’ experience, everyone seems to think that investing in a monster seems like a great idea! However, the Turner family soon realizes this is not exactly the monster they ordered at all. He likes to pull pranks, paint murals where art work isn’t wanted, plus when he eats grass, he gets gas! Stinky, smelly, in-your-face gas that makes everyone sick! Plus, even though he likes to be helpful, he is a terrible baker and he REALLY smells! Is their monster defective? Should he be returned? This story is about finding love in the most unexpected places, even if the one you love is a big, stinky monster. 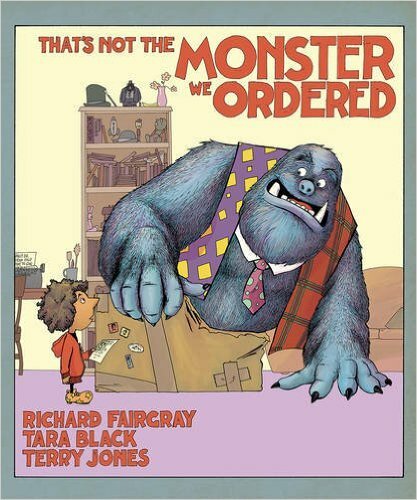 That’s Not the Monster We Ordered is a fun and silly picture book about how something can be pretty great even though it’s not quite what you expected. This book from the brilliant minds behind Gorillas in Our Midst and My Grandpa Is a Dinosaur, Fairgray and Jones, have blended imagination into the real world, creating an entertaining story everyone will enjoy. Newcomer Tara Black adds an enjoyable new twist on traditional household pets and is full of enough silly antics to warrant multiple rereads. Everyone deserves a chance at love and acceptance for being who they are – even a monster. About the Author: Richard Fairgray was born and raised in New Zealand and has been publishing since he was seven years old. He has been working exclusively in comics for the last seven years with longtime collaborator Terry Jones. Their main work together is the ongoing series Blastosaurus. He lives in Auckland, New Zealand. About the Author: Tara Black is the cowriter and artist on the daily webcomic I Fight Crime, which has been running since 2009, producing over 1,800 strips. She has been coloring Richard and Terry’s work since 2010, most notably on Blastosaurus, as well as several picture books and comic side projects. She lives in Auckland, New Zealand, with her dog and her husband, both of whom wish to remain anonymous. About the Illustrator: Terry Jones was born in Wales. He taught high school–aged kids in the United Kingdom for many years before immigrating to New Zealand. He has written newspaper and magazine articles, some nonfiction works, and two novels, The Left-Handed Gun and The R.U.M.B.L.E.R. He lives in Auckland, New Zealand. About Sky Pony Press: Sky Pony Press, with their Good Books, Racehorse and Arcade imprints, is proud to publish a broad range of books for young readers—picture books for small children, chapter books, books for middle grade readers, and novels for young adults. Their list includes bestsellers for children who love to play Minecraft; stories told with LEGO bricks; books that teach lessons about tolerance, patience, and the environment, and much more. While not every title they publish becomes a New York Times bestseller or a national bestseller, they are committed to books on subjects that are sometimes overlooked and to authors whose work might not otherwise find a home.